Written by Jean Sealey for The Florida Times-Union. Golfers have a reputation for philanthropic efforts. Most have a desire to give back to their communities, support veterans and lend a hand to those in need. They are linked not only by the profession they share, but by the faith many of them profess. 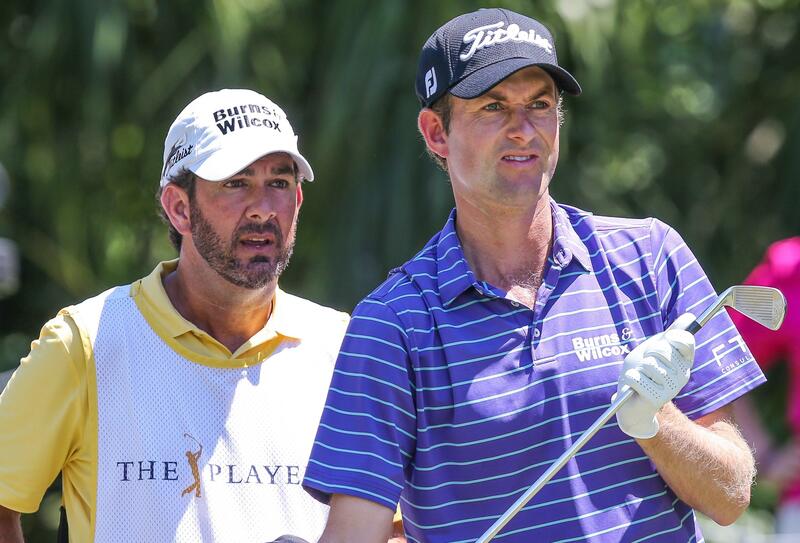 A shining example of that special relationship can be seen between PGA Tour player Webb Simpson and his caddie, Paul Tesori. When the two men began working together, Tesori had completed a few years as a pro on the Tour. The three-time collegiate All American had decided that pro golf was not the career he wanted to pursue. Michelle Tesori (left) holds baby Dakota Watson during the 2014 Masters Tournament. 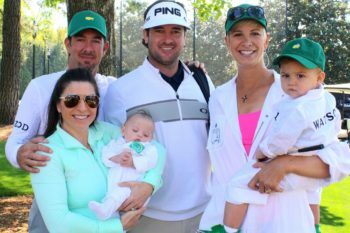 Also pictured are Paul Tesori with Bubba Watson and his wife, Angie, who holds their son, Caleb. Watson and Tesori, along with many others on the Tour, are deeply rooted in their Christian faith and committed to charitable projects. He enjoyed the game itself. He loved the interaction with other golfers. To continue doing what he loved with less pressure, he decided to become a caddie. He caddied first for Vijay Singh, then for Jerry Kelly and Sean O’Hair before partnering with Simpson. It is widely known that Simpson is a devout Christian, who unhesitatingly makes his faith part of his daily life and conversation. Simpson won the U.S. Open in 2012, earning Tesori his first career major win as a caddie. They have moved from 218th in the world to as high as fifth and continue to have success both on and off the course. 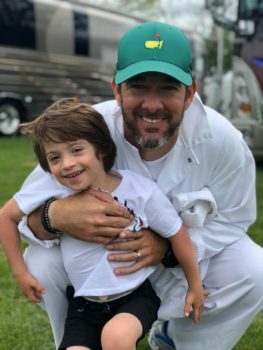 Isaiah Tesori, age 4, enjoys the company of his dad, Paul, during the 2018 Masters Tournament. The Tesori Family Foundation was founded in 2009. Tesori and Michelle, his then-fiancée and now wife, wanted to give back to those in need in the Northeast Florida community. In 2014, after the much-anticipated arrival of their baby Isaiah, who was born with what the Tesoris describe as his “extra-special extra chromosome,” the foundation expanded to focus on children throughout the United States. The foundation hosts a golf clinic for children with special needs that in four years has grown to serve children in Greensboro, N.C., Charlotte, N.C., and Ponte Vedra Beach. The All-Star Kids Clinic has become so popular it is now an annual event at Sawgrass during the first week of The Players Championship. In addition to Tesori, pro golfer Jordan Spieth and coaches from First Tee of North Florida are on hand to work with the group and give individual attention to each of the 25 participants. “I like to brag about what I consider my biggest professional achievement,” Tesori said. “I have participated in a team event with each of the pros I’ve caddied with, and I’m proud to be in my eighth season with Webb. But above all that, what gives me purpose and joy in my life is best expressed in our foundation’s mission statement, ‘to achieve great things through God by lending a helping hand, providing hope and healing hearts for children’.